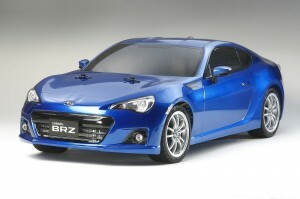 This is a 1/10 scale assembly R/C kit of the Subaru BRZ, which was released to the driving public in March 2012. The BRZ is a compact, front engine rear-wheel drive sports car powered by one of Subaru’s trademark boxer engines, a 2.0-liter 4-cylinder unit. Its lightweight, rigid chassis was designed to give the driver an exciting driving experience and features a low center of gravity as well as a specially-tuned front strut, rear double wishbone suspension setup. The Tamiya Radio Control replica is mated to the easy to assemble TT-01 Type-E chassis platform, which is ideal for new hobbyists entering the radio control modeling hobby. If you like this article, check out this additional article on Tamiya.